WHATEVER HAPPENED TO THE ADASTRA 707? VH-EAA was delivered to Qantas on the 12th December 1967 as "City of Toowoomba". In April 1977, the aeroplane was sold to ITEL and leased to Young Cargo and placed on the Belgian register as OO-YCK. In September 1979, the aircraft was leased to Air Niugini as P2-ANB. It served with Air Niugini until April 1985 when it was sold to TRATCO and placed on the Icelandic register as TF-AEB. Under this registration, it served several airlines including ZAS of Egypt and Air Arctic of Iceland. In April 1986 the aircraft was re-registered 5Y-AXA to African Express Airlines of Kenya. By this time, one might have thought that the aeroplane had reached the twilight of its career as an aerial tramp steamer, just one step away from the boneyard. Not so! The former VH-EAA headed back to the country of its birth where it was re-registered N733Q and later N526SJ. Although the aircraft served with CF Air Freight, the registration N526SJ implies a connection with Miami based Southern Air Transport, who are better known as the modern day equivalent of Air America i.e. a CIA operation! 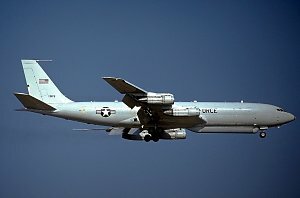 In May 1984, the United States Air Force and Army decided to mount their new Joint STARS radar system on a Boeing 707 platform. Although it might be expected that such new and expensive technology would warrant new-build airframes, budgetary restrictions dictated that the program would be based on used 707s! Denied new 707s, the U.S. military clearly would not accept anything but the best, used 707s, so they scoured the world for the best available. It is perhaps not so surprising that of the aircraft chosen, no fewer than seven were former Qantas aircraft. Included amongst them was the former VH-EAA which assumed "stars and bars" and the military serial number 90-0175. Redesignated an E-8, the aircraft was fitted with state of the art radar systems for long range air-to-ground surveillance of ground targets in all weather conditions. The concept was successfully tested live when two E-8s deployed to the Middle East for Operation Desert Storm in 1991. Photo courtesy of Michael Schmidt. Having acquired a taste for the "clandestine" back in 1975, our old friend EAA may have gone on to dabble on the fringes of CIA activity in the eighties, and now in the next century, this 36 year-old veteran is probably about to go to war. An ancient aeroplane loaded with state of the art equipment worth many times the value of the airframe. Sound familiar? That is what happened to the Adastra 707. This is what might have happened.